Southern Illinois University Edwardsville Intercollegiate Athletics enjoyed a banner year with a top 100 performance in the Learfield Directors’ Cup final standings. SIUE finished 94th in the standings and fared better than any other Ohio Valley Conference, Missouri Valley Conference or Southern Conference institution, the three conferences in which the Cougars competed during the 2016-17 athletic year. As a full-fledged NCAA Division I program since the 2012-13 season, SIUE’s 2016-17 season has been outstanding. This is the first time SIUE has finished in the top 100 in the Division I Directors’ Cup standings. “It speaks volumes for how effective and efficient our student-athletes, coaching staff and support staff have been,” added Hewitt. The Cougars scored points in five sports – men’s and women’s soccer, men’s indoor track and field, wrestling and women’s tennis. Men’s soccer advanced to the Sweet Sixteen of the College Cup after advancing past Michigan State and Butler. Women’s soccer was a NCAA Tournament second-round participant after knocking out nationally-ranked Notre Dame. Men’s indoor track and field and wrestling each walked away with All-Americans. The women’s tennis program appeared in the NCAA Championships for the second straight season. 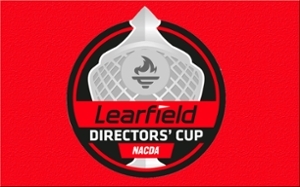 The Learfield Directors’ Cup was developed as a joint effort between the National Association of Collegiate Directors of Athletics (NACDA) and USA Today. Points are awarded based on each institution’s finish in up to 10 men’s and 10 women’s sports in Division I.
Stanford was the overall winner. More interesting facts on SIUE's finish in the Learfield Directors’ Cup.